Previously we discussed how to use multiple Gmail id in single browser now lets see another interesting thing, the most easiest and useful tips to use multiple gtalk application just by adding /nomutex as suffix to the Target link of the gtalk icon. confused still ? The screenshot below will explain you very easily. Right Click on the gtalk icon in start menu. add /nomutex at the end of the Target link. 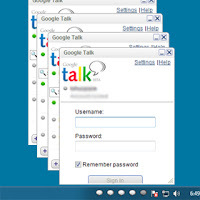 Now again run gtalk application by clicking on gtalk icon. you can see a new gtalk window, where you can sign in to your new alternate account. cool tip. Thanks for sharing..